This 33 minute rosary was created as a devotion to the Mother of the East and as a way to bring East and West together. Follow in the footsteps of Kuan Yin as you join in this rosary of love and forgiveness and let this light flow through you to emanate blessings and compassion to all. This rosary of contemplative prayer was designed to help devotees of Kuan Yin to become one with her compassionate and merciful heart. Kuan Yin known as the Mother of Mercy in the East, has been worshipped by Buddhists for thousands of years. She is the greatest of Bodhisattvas and embodies the totality of compassion for humanity. She removes obstacles, erases past offenses, dispenses mercy, healing and spiritual graces, while always meeting the true inner needs of the soul. If you purchase a physical copy of the CD it comes with a beautiful 25 page full color booklet that includes all the words to the songs and prayers. 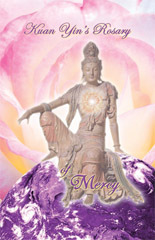 The booklet also includes 8 pictures of Kuan Yin from artists around the world. "This day you have planted a great seed of light here that will grow into a new tree of light, a tree of compassion, a tree of mercy-joy. And as each of you, who have also planted this seed within the soil of your own being, water and nurture this light of mercy day by day as you participate again and again in this gentle embrace of my heart and mercy’s light, your own Bodhi tree will be there for you to experience as you meditate under it for the victory of your heart, your mindfulness, blessed ones." "I am Kuan Yin. And I would have you know that each and every time that you give the Rosary of Mercy with me, I extend currents of my heart’s fire to you personally and to all those in your extended families who require the healing power of Mercy’s flame. Yes, dearest ones, you may not always be aware of exactly how the words that you speak become tangible in the world of form, and yet I say that through many of my assistants and angel devas who are masters in the focalization of the light of mercy in your world, miracles can ensue and do in your domain because you have allowed your own heart to be a focal point for this mercy light to radiate forth and for God, through this light, to be present in many realms of being."